Early Thursday morning militants from the al-Shabaab terror group stormed Garissa University College in Kenya and killed at least 147 students. The second worst terror attack in Kenya’s history lasted 13 hours and was made excruciatingly horrific by the fact that many of the victims remained in communication with their loved ones until the very last moments. Unbearable images of young students laying dead in their own pools of blood in classrooms will forever be etched in Kenyans’ memories. The attack echoed the September 21, 2013 Westgate Mall terror attack that killed 67 people. After Westgate many Somalia analysts insisted that such daring missions were the kicks of a dying horse, and cited successes by AMISOM and AFRICOM in taking back territory from al-Shabaab and decapitating the organization through drone strikes against it leadership. 1. 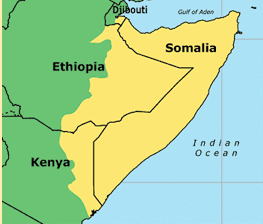 Regional powers do not want a powerful central government in Mogadishu: Since independence several governments in Somalia have espoused a dream of re-uniting all the Somali lands and peoples in eastern Africa (under “Greater Somalia,” see map). That includes parts of Ethiopia, Kenya, Djibouti, and more recently the breakaway regions of Somaliland and Puntland. A strong central government in Mogadishu would most certainly revive this old irredentist dream, despite the fact that the irredentist dreams of Somalia’s pre-Barre governments and the costly wars with Ethiopia (and proxy wars with Kenya as well thereafter) were the beginning of the end of stability in Somalia. Nairobi and Addis are acutely aware of this and that is part of the reason Kenya has for years maintained a policy of creating an autonomous buffer region in southern Somalia – Jubaland. The problem, however, is that a weak Mogadishu also means diffused coercive capacity and inability to fight off breakaway clans, militias, and terror groups like al-Shabaab. The situation is complicated by the fact that Ethiopia and Kenya do not see eye to eye on the question of Jubaland. Addis Ababa is worried that a government in Jubaland dominated by the Ogaden clan could potentially empower the Ogaden National Liberation Front (ONLF), a separatist Somali insurgent group it has fought in its southeastern Ogaden Region. 2. The African Union and its regional partners do not have a coherent game plan for Somalia: To a large extent, African governments fighting under AMISOM are merely carrying water for Western governments fighting jihadist elements in Somalia. The West pays and provides material and tactical support; and the West calls the shots. Ethiopia and Kenya have some room to maneuver, but overall policy is driven by AFRICOM and the Europeans. The lack of local ownership means that African troops, especially the Kenyan and Ugandan contingents, are in the fight primarily for the money. Kenyan generals are making money selling charcoal and smuggling sugar (the UN estimates that al-Shabaab gets between US $38-56m annually from taxing the charcoal trade). The Ugandans are making money with private security contracts dished out to firms with close ties to Museveni’s brother. Only the Ethiopians appear to have a clear policy, on top of the general international goal of neutralizing al-Shabaab so that they do not attack Western targets. What kind of settlement does Kenya (and Ethiopia) want to see in Somalia? (See above). What does the West want? What do Somalis want? Are these goals compatible in the long run? 3. The internationalization of the al-Shabaab menace is a problem: Western assistance in fighting al-Shabaab and stabilizing Somalia is obviously a good thing. But it should never have come at the cost of unnecessary internationalization of the conflict. Al-Shabaab has been able to get extra-Somalia assistance partly because it fashions itself as part of the global jihad against the kafir West and their African allies. Internationalization of the conflict has also allowed it to come up with an ideology that has enabled it to somehow overcome Somalia’s infamous clannish fractionalization (although elements of this still persist within the organization). Localizing the conflict would dent the group’s global appeal while at the same time providing opportunities for local solutions, including a non-military settlement. AMISOM and the West cannot simply bomb the group out of existence. 4. Kenya is the weakest link in the fight against al-Shabaab: Of the three key countries engaged in Somalia (Ethiopia, Kenya, Uganda), Kenya is the least militarized. It is also, perhaps, the least disciplined. According to the UN, Kenyan troops are engaging in illegal activities that are filling the coffers of al-Shabaab militants (charcoal worth at least $250 million was shipped out of Somalia in the last two years). Back home, Nairobi has allowed its Somalia policy to be captured by a section of Somali elites that have other agendas at variance with overall national policy. The Kenya Defense Force (KDF) risks becoming a mere pawn in the clannish struggles that straddle the Kenya-Somalia border. It is high time Nairobi reconsidered its Somalia policy with a view of decoupling it from the sectional fights in Northeastern Province. The first step should be to make the border with Somalia real by fixing customs and border patrol agencies; and by reining in sections of Somali elites who continue to engage in costly fights at the expense of ordinary wananchi. The government should adopt a strict policy of not taking sides in these fights, and strictly enforce this policy at the County level. (i) Generals can run rings around State House and its securocrats: Unlike their counterparts in Uganda and Ethiopia, the Kenyan generals do not have incentives to internalize the costs of the war in Somalia. The cost is mostly borne by the civilian leadership. They are therefore likely to suggest policies that primarily benefit the institution of the military, which at times may not be in the best interest of the nation. And the civilian leadership, lacking expertise in military affairs, is likely to defer to the men in uniform. The result is makaa-sukari and other glaring failures. (ii) Kenyan internal security policies are subject to politicization: With every al-Shabaab attack (so far more than 360 people have been killed) Kenyans have wondered why Ethiopia, which is also in Somalia and has a large Somali population, has remained relatively safe. My guess is that Ethiopia has done better in thwarting attacks because it has a coherent domestic security policy backed by unchecked coercion and surveillance of potential points of al-Shabaab entry among its Somali population. Now, Kenya should not emulate Ethiopia’s heavy-handed tactics. Instead, focus should be on an honest assessment of how internal security policies in Mandera, Garissa, Wajir, Kwale, Kilifi, Mombasa, Nairobi, and elsewhere are playing into the hands of al-Shabaab. What is the best way to secure the “front-line” counties that border Somalia? What is the role of local leaders in ensuring that local cleavages and conflicts are not exploited by al-Shabaab? How should the security sector (Police and KDF) be reformed to align its goals with the national interest? What is the overarching goal of the KDF in Somalia and how long will it take to achieve that goal? How is the government counteracting domestic radicalization and recruitment of young Kenyan men and women by al-Shabaab? These questions do not have easy answers. But Kenyans must try. The reflexive use of curfews and emergency laws, and the blunt collective victimization of communities suspected to be al-Shabaab sympathizers will not work. I do not envy President Uhuru Kenyatta: Withdrawing from Somalia will not secure the homeland. Staying the course will likely not yield desired results given the rot in KDF and the internal politics of northeastern Kenya. Reforming the police and overall security apparatus comes with enormous political costs. A recent shake up of security chiefs and rumors of an impending cabinet reshuffle are signs that Kenyatta has realized the enormity of the insecurity situation in the country (and overall government ineffectiveness due to corruption). But will Kenyans be patient and give him the benefit of the doubt? Will the president be able to channel his laudable nationalist instincts in galvanizing the nation in the face of seemingly insurmountable security threats and ever more corrupt government officials? For the sake of Kenyan lives and the Jamuhuri, nakutakia kila la heri Bwana Rais.